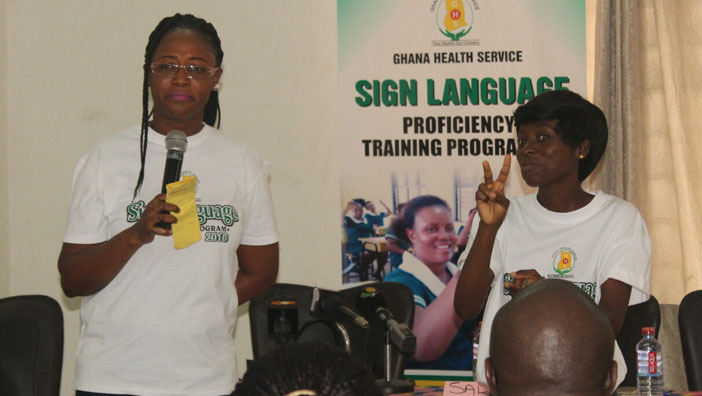 Forty healthcare workers have graduated with sign language proficiency after four weeks of training organised by the Ghana Health Service (GHS), in collaboration with the Supreme Sign Language Institute. The graduates from various health facilities in the Greater Accra Region, including the Korle-Bu Teaching Hospital and Polyclinic, LEKMA, Usher Clinic, Adabraka Policlinic, La General Hospital, Abokobi and the Greater Accra Regional Hospital, Ridge, were presented with certificates in a short ceremony at the GHS Training Centre, Accra. A representative of the Director General of the GHS, Gabriel Amoah, said the objective of the training is to give equal opportunity to all Ghanaians, including persons with speech and hearing disabilities, to access quality healthcare for all in order to achieve Universal Healthcare (UHC) Coverage. He congratulated the participants for their commitment and urged them to use the knowledge and skills acquired to improve on their engagements with their clients, especially those with hearing and speech impairment. Dr. Esi Turkson Cofie, the Director of Metropolitan Health Service, GHS, who chaired the event, mentioned that the move is a great step in Ghana’s health sector, as it would contribute to ensuring inclusive, equitable and quality care for all as envisioned in the pursuit towards UHC. She pointed out that with the learning of sign language, health professionals can now give better services to persons with hearing challenges. Dr. Cofie observed that the lack of effective communication with persons with speech and hearing disabilities at the hospital settings often led to miscommunication and delayed care, adding that the current intervention would guarantee quality diagnosis and drug dispensation for those vulnerable groups. Newell Agbe, Executive Director of the Supreme Sign Language Institute, pledged the institute’s continued commitment and partnership with the GHS to provide quality sign language training. The course, he said, involves basic interpersonal skills, sign language vocabulary usage and their application in dialogues, especially within the hospital setting. “However, this number is still very low, and we intend to expand the training to other regions, districts and zones across the country over the next five years to ensure that at least all healthcare facilities have sign language interpreters for effective communication with clients, and to guarantee quality service delivery,” Mr Agbe stated. Maame Fosua Frimpong Ansah, a nurse from the Mamprobi Polyclinic who shared her experience with DAILY GUIDE, stated that she had gained a better understanding of communicating effectively with the hearing and speech impaired. “First because we did not understand them when they come to the hospital we sometimes misdiagnose them and give them the wrong medication. But now that would not happen,” she disclosed. Richard Ephane, a hearing impaired person who was present at the ceremony, expressed his delight at the training of health staff in sign language. He observed that going to the hospital was a challenge due to the communication barriers between him and health officers. Mr. Ephane was, therefore, optimistic that the training would make hospitals in the Greater Accra Region friendlier to the hearing and speech impaired.